I’ll be upfront, this one moves a bit slowly for me. However, that doesn’t entirely rule me out from recommending A Dark Song, a film by Liam Gavin (his directorial debut). 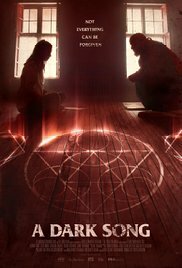 A Dark Song is the story of Sophia (Catherine Walker), a grieving mother that has lost her child. She enlists the aid of Joseph (Steve Oram) to undertake an ancient, complicated, long ritual that will allow her to contact her guardian angel. Here are five reasons to watch it this weekend. Sophia isn’t in the mood to have a friendly chat with her guardian angel. She doesn’t want someone to braid her hair or give her a good apple crumble recipe. She’s not hoping to write a feel-good bestseller that will help other grieving parents. Nope, Sophia’s out for blood. Her child was lured away and murdered, and she wants to enlist her guardian angel to help obtain justice for her child. If you have children – even if you don’t and have someone who you love very deeply – you’ll appreciate this dark streak of human nature. We often don’t want to admit that piece of us is there, but it’s a dark, primal part that we can’t deny. In the end, some people are worth giving up our souls. Most horror movies have a ritual that takes maybe a few hours tops. Hell, most cinematic exorcisms take place on a dark and stormy night, with immediate results. The ritual in this film is extremely involved and requires multiple steps. How long? Joseph informs Sophia that they’re going to need months of supplies for success. Not days – this puppy is going to last months, and it’s intense too. It’s intricate and time-consuming and that’s all anyone can do. It’s refreshing to see something that doesn’t take 30 seconds to complete. We get the process and an appreciation for the preparation and ritual itself. An offshoot of the previous reason to watch this film is the seed of doubt. As this ritual takes a looooooong time to come to fruition, it’s easy to doubt whether or not it’s working. That means we get to watch as Sophia’s otherworldly intentions get threatened by a dose of reality. Suddenly, the demands seem weird, and there’s concern that she’s being conned. We’re right along with her, because while we want to believe something mystical and forbidden is about to happen in front of us, we’re also worried that we’ve been sold a bag of beans too. The film does a fine job of handling this doubt and exploration of character development and honesty. #4 – What could possibly go wrong? Oh this is a fun reason, and by “fun” I mean “train wreck in the best possible horror movie sense of the word” way. We’re dealing with the supernatural here and a ritual that pushes its participants toward the limits of sanity. What, pray tell, could possibly go wrong? A lot. A lot could go wrong. From angry fits to what the grueling process entails to the final product, you watch this film because you know damn well that the participants are going to get far more than that which they bargained. I was expecting this film to end one way, but it didn’t go there. In fact, I rather like what Gavin did with the ending. I won’t spoil it or any details of the plot, but know that it’s an intriguing take on the efforts to raise the otherworldly for vengeance theme. A Dark Song is available for streaming on Netflix.